In the first chapter, Elisha’s estranged brother come to him for help because his, the brother’s, wife is suffering through a terrible delivery. Elisha finds the baby is breech and also the baby is already dead. 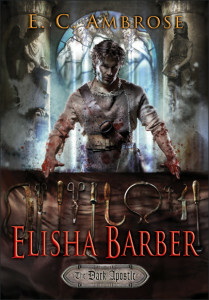 In order to save his brother’s wife, despite the horror of this kind of surgery, Elisha cuts the dead baby into pieces and delivers the body that way. Despite his efforts, the wife dies. His brother commits suicide. End of chapter. Now, tell me, assuming the book is well written and the (extremely gritty) setting well-drawn, would you keep going? Of course you can’t answer that without actually reading the first chapter for yourself. If you want to do that, here is the link to the book on Amazon. However, this is the sort of beginning that I find practically unbearable, no matter how admirable a man Elisha is. Is there anything that could have made this work for me? Drop all that into the backstory. Don’t tell it as a prologue, just leave it a dark mystery in a tragic past. Jump ahead a couple of decades, or at least a couple of years, or at the very least a couple of months. Start the story wherever seems advisable. Move ahead with the action. Gradually reveal the tragic backstory as you tell the rest of the story. That, in case you are curious, is how to keep a horrible, horrible incident without causing readers like me to recoil violently and then either delete your book or give it away. The distance gained by putting the tragedy in the past makes it far more tolerable to read about, particularly if the protagonist has managed to come somewhat to terms with the horrible incident. I’m just mentioning this as a way to make it work for readers who otherwise might not get past the tragedy and into the real story. Previous PostDown to two ultimately cute puppies	Next PostBored of? Or bored with? One of my recent DNF’s is NK Jemisin’s “Obelisk Gate”. I got through “Fifth Season” but it did not pass my internal “will I want to read this again?” test but I thought Obelisk might get better but it didn’t so I gave up a few chapters in. My reason? I just couldn’t like the characters no matter the epic twists and turns in the plot. I kept having this vision in my head of Jemisin going “now how can I be even more clever with this?” One other thing I do with an author I hadn’t read before is flick to the middle of the book and just read that page. Tells me if I want to keep on reading. I’m far, far beyond tired of dead mothers as backstory- dead girlfriend/wife/daughter is now rarer than it had been as a motivation for male characters (though still frustratingly common) but I can’t browse a “top ten” list of YA novels without one or more where dead mothers kick off the story. I read the sample yesterday and also wouldn’t go on but for different reasons: I don’t trust the author. The scene setting was confusing, I kept arguing with what was shown not being historically accurate for the apparent setting, and by the time I got to a mention of King Hugh and London I was in full nit-pick mode, and finding lots of nits. Then add the over the top ‘tragic’ opening with added ‘excitement’ of idiotic running around, and I see no reason to go on. I think putting it all in backstory would have worked better for me, but the other issues would probably still have had me deleting the book. I don’t like having an opening focusing on a character just to kill him off either. I think I need to believe in the setting or the characters, and the writing has to not put me off. I put down something … I think it was by Wrexler? Django W … where the writing was good, I wasn’t nitpicking or anything.. but something was grating about the prose. And the character(s) and visible plot weren’t interesting enough to get me to go on in spite of that. I have the same reaction to Bradbury’s prose, but for some (not all) of his stuff I can push through it. Since I gather it’s not really supposed to be historically accurate, I wasn’t looking for nits to pick … but I agree the idiotic running around was, well, idiotic. Django Wexler. The Thousand Names? Nothing grated on me, the last book in the series is on my Most Anticipated List for this year. But actually I also have always had trouble with Bradbury, though objectively one would think his style would appeal to me.